A long time ago in a galaxy far, far away…oh wait. No, but really, back in the day I made these perfect protein pancakes, which I still stand by even though the pictures are atrocious (note to self: re-do those. *Update – I did, check them out!) and told you all the secret ingredient was cottage cheese. Even longer ago, I made these pancake battered pineapple rings and raved about how it was basically the best thing ever. 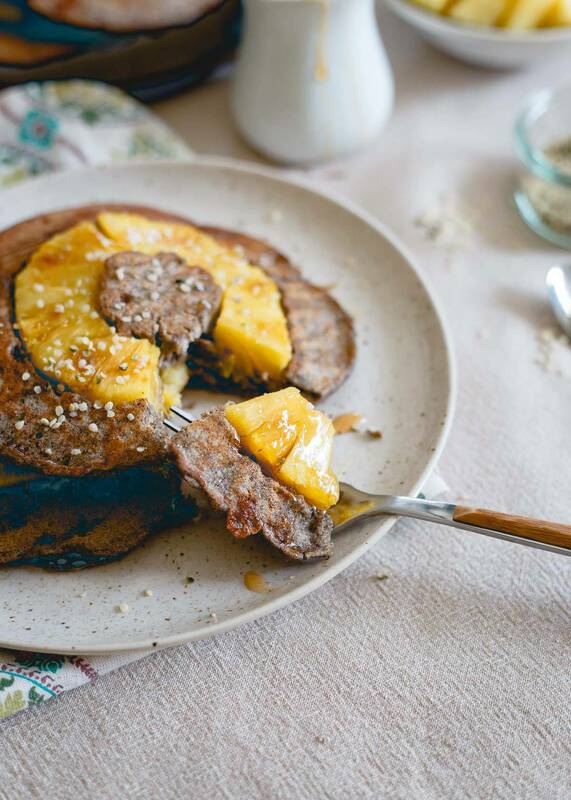 *These pineapple buckwheat pancakes are made in partnership with Muuna cottage cheese. 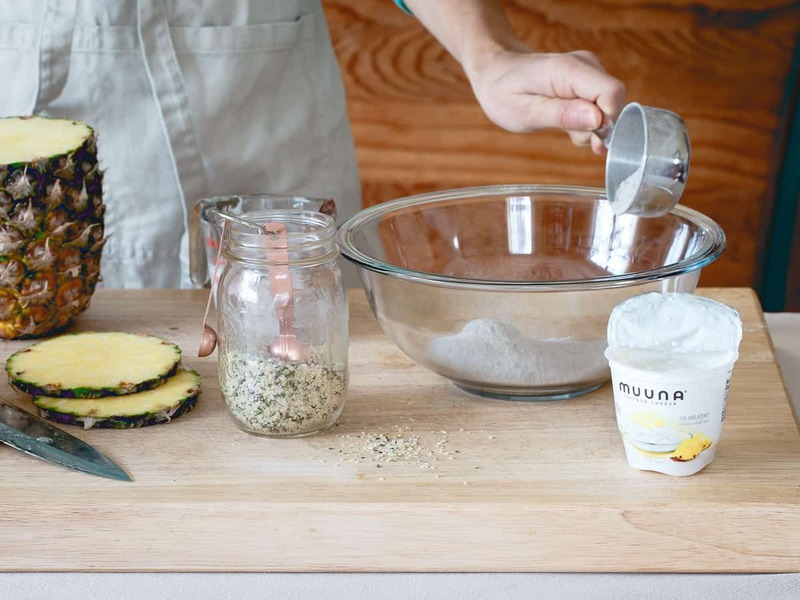 Today, with a bit more experience behind the lens, I’m bringing both those things together in these pineapple buckwheat pancakes. 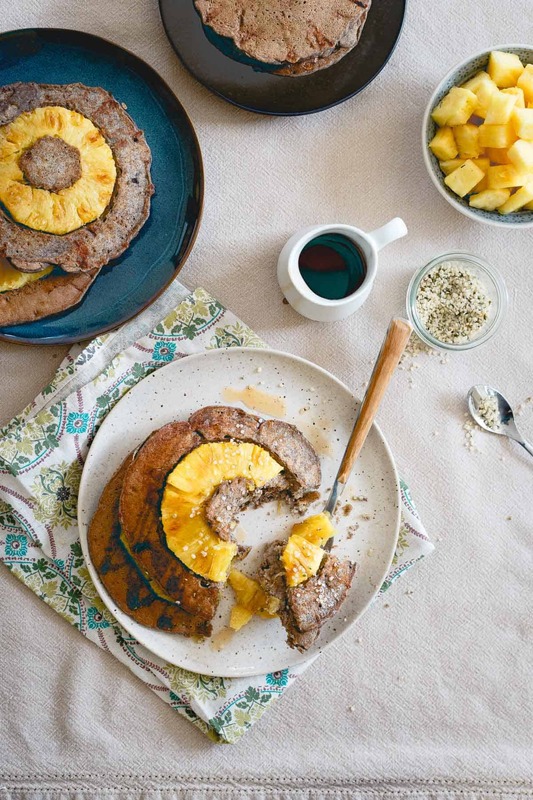 Made with cottage cheese for a nice protein boost, each one adorned with a sweet caramelized pineapple ring and studded with hearty and nutritious hemp seeds both in and on top, I think this stack trumps both old recipes for best “overall”. Have you guys seen Muuna on the shelves in your grocery store yet? It’s on select shelves in the Northeast right now (you can find it at ShopRite and Shaw’s) and a relatively new addition to the dairy aisle in my favorite store. The second I spotted it though, I was intrigued. It was kind of one of those “well, DUH” moments when thinking about it. Single serve cottage cheese with delicious fruit on the bottom. There’s only about ten billion varieties when it comes to yogurt, why not cottage cheese too, right?! Further inspection showed me no HFCS or artificial flavors and a near perfect protein (15g in the fruit varieties!) to carb to fat ratio for these to work as a pre or post workout snack for me and I promptly put one of each flavor in my cart. While they all sounded delicious, I grabbed the pineapple as my first one to try (something about those old school memories of pineapple cottage cheese my grandma always had in her fridge when we were younger) and was instantly blown away by the flavor and even more so, the melt in your mouth creaminess. It was unlike any other cottage cheese I’ve had before and practically dessert-like. 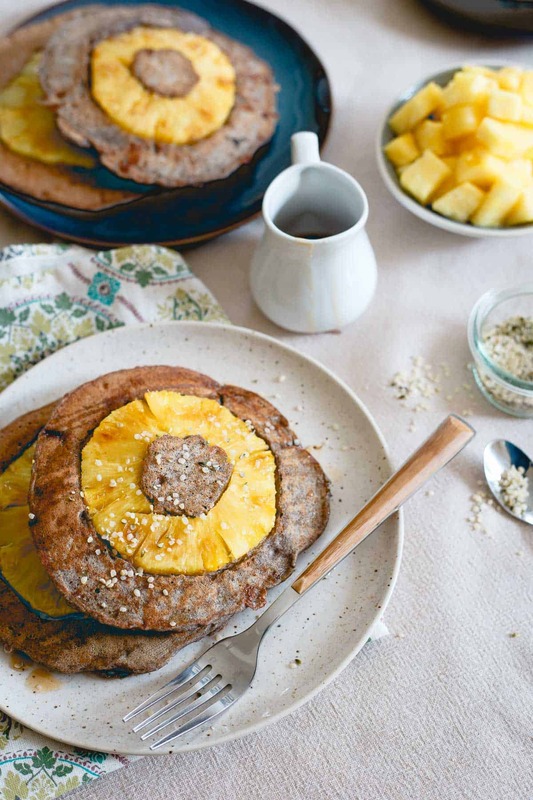 Tasked with developing with a pancake recipe to go along with a “seeds of health” theme, this hearty, subtly sweet stack of pineapple buckwheat pancakes was born. Hearty buckwheat and almond flours combined with nutritious hemp seeds and protein packed cottage cheese definitely result in a pancake with some staying power. I love using heartier flours in pancakes as evidenced in these cinnamon raisin oat bran pancakes and even in those protein pancakes I mentioned above (they use cottage cheese too!). It’s sometimes hard for me to feel full from a pancake breakfast but heartier flours (and a higher protein content) definitely help! This isn’t your fluffy-airy pancake house, topped with strawberries and whipped cream kind of stack. This is a stick to your ribs kind of pancake that straddles the “I’m definitely eating something healthy for me” and “it’s ever so slightly sweet enough to not taste healthy” line. The perfect balanced place to hang out when it comes to food in my opinion. That life-changing paczki I tried on Fat Tuesday for the first time begs to differ. Connect on Facebook, Twitter, Pinterest and Instagram with #Muuna. 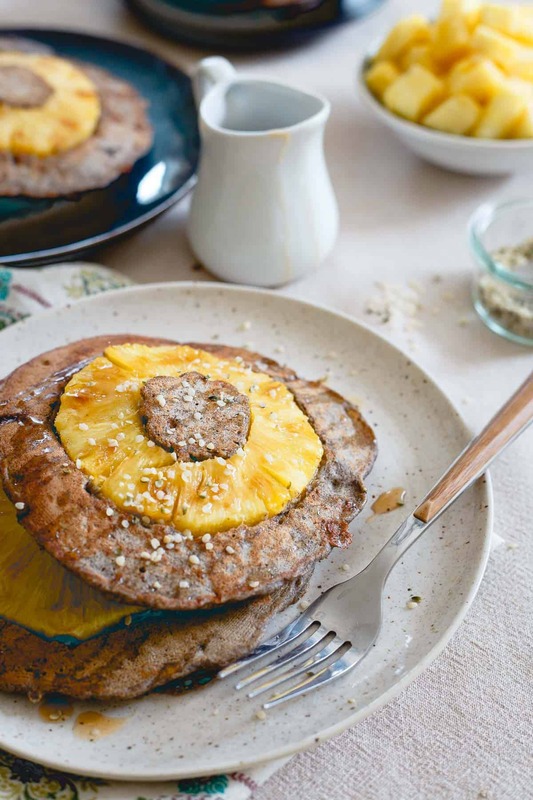 These pineapple buckwheat pancakes are studded with hemp seeds and whole rings of fresh pineapple. They're the perfect balance between hearty and sweet. Heat a pancake griddle or pan over medium heat. 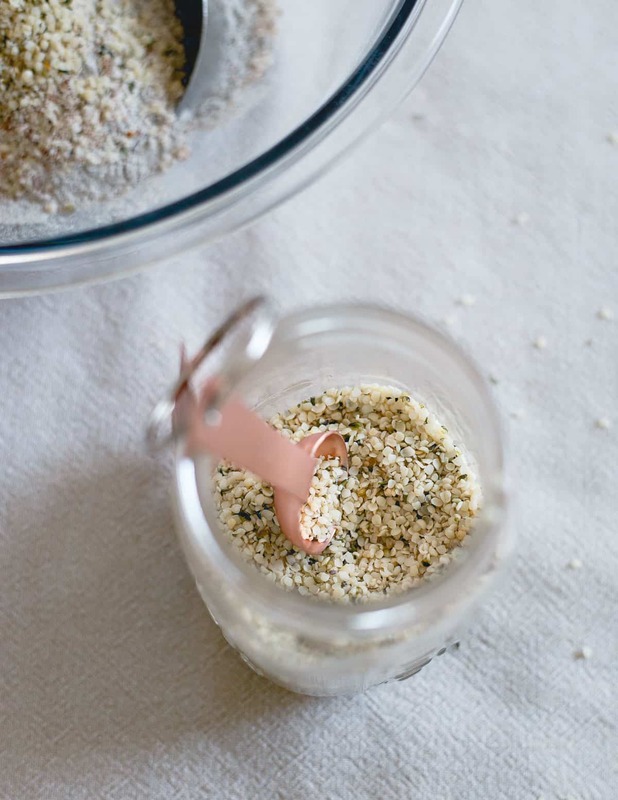 Combine flours, hemp seeds, baking powder, allspice and salt in a large bowl and whisk until combined. Add cottage cheese, egg, maple syrup, vanilla to the bowl. Whisk as you slowly add the milk until everything is well combined. Add a small bit of butter to the pan. Once melted, place one pineapple ring on top and cook until golden brown and starting to caramelize. Flip the pineapple slice over, spoon pancake batter on top so that it covers the ring entirely and spills over the sides a bit. Cook until set (about 3 minutes), carefully flip and cook another 2 minutes on the other side. Repeat with remaining pineapple rings and batter. Serve with maple syrup and extra hemp seeds for topping. I haven’t seen Muuna yet. I’ll have to check next time I’m at the market Gina, because I need to try these pancakes! That pineapple on top tho…looks delish! I’ve been trying to find Muuna for the longest time! Hopefully I can find it soon so I can use it to make these hearty pancakes! I bet these would be perfect with coconut whipped cream! Hope it pops up near you soon, it’s SO delicious! These are PERFECT. 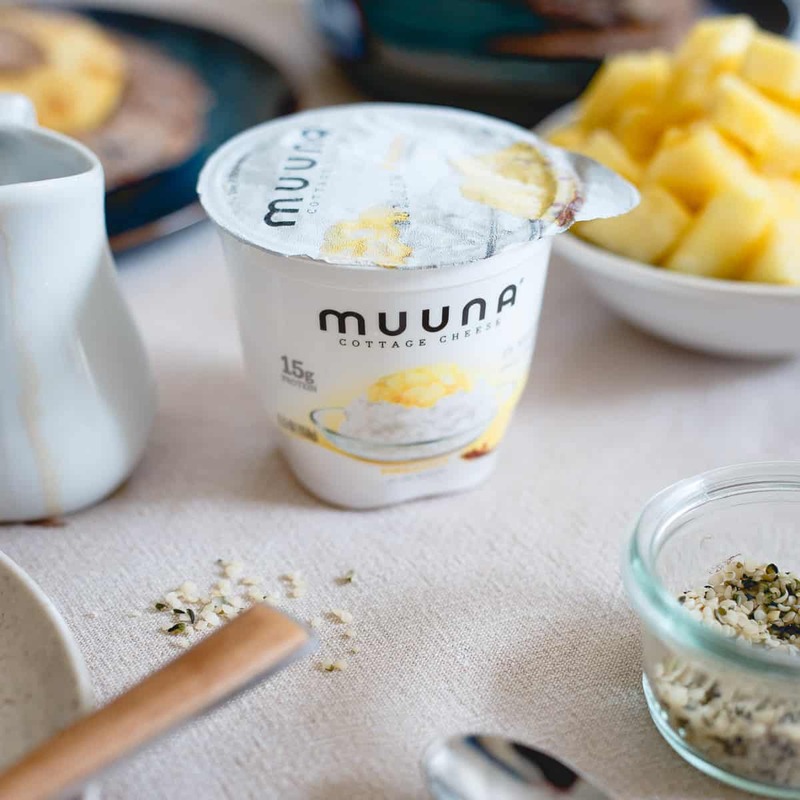 Loving the pineapple Muuna cottage cheese! Loving this combo! Pineapple anything is my favorite! Looks yummy! We always looked forward to the west Virginia buckwheat festival! !can’ t wait to try these! These would be the perfect, post-workout weekend breakfast! Does this recipe really only make 4 pancakes? Thanks! No, it serves 4 people. Depending on how big you make the pancakes, there will be more than 4 total.